Sorry I've been AWOL for the past week or so. I've been crazy busy with my new job and haven't had the energy to do any more computer work once I get home. I'm so excited to share that I just passed my three month anniversary at my new job and I am officially a regular, full-time employee! I have all those regular employee perks, like paid time off, snow hours and holidays. Though I don't think I'll be using my time off anytime soon. Why you might be asking? Three factors. 1. In my first three months, there have been so many holidays and snow days. These three months have flown by in a blur. 2. I have a ton of work trips coming up in the next two months. I'll be jetting off to Singapore on Monday, with trips to Geneva, Oxford and San Diego shortly following! 3. The boyfriend also just started a new job, he's finishing his third week! He probably won't want to be taking vacation in his first month on the job. I suppose that it's great that I'm not chomping at the bit for vacation time, it means that I've been really enjoying my new job! I enjoy going to work everyday, even with the long train commute. The people that I work with are fantastic. Fun, smart and a great team to have. I can't wait to see what we can all accomplish together! Though I have been missing my weekday breakfasts. I've gone back to my favorite apple cinnamon oatmeal during the week, but nothing beats a mid-week plate of French toast. That's exactly what I did with this bread. I made the bread on Saturday and made it into French toast on Sunday. I haven't made a yeasted bread in months and it was so nice to knead the dough and watch my baby rise! Still not sure of your skills with yeast? Try this bread, it's super easy. Look at that delicious crumb! Mix together ingredients for the sponge and let sit at room temperature for 60-90 minutes. It will bubble up and then start to fall in on itself. For the dough - In the bowl of your stand mixer, cream together sugar, salt, powdered milk, unsalted butter and vegetable shortening. Add eggs and extracts and beat until combined. Switch to a dough hook (or use a strong wooden spoon) and add sponge and flour. Turn mixer on low and let knead until a dough comes together (or stir stir stir with that wooden spoon!). If kneading by hand, pour dough out onto the counter and knead for about 15 minutes. If using a stand mixer, turn mixer on medium and let knead for 10 minutes. Lightly coat a bowl with cooking spray and toss dough in, roll to coat dough in oil. Cover bowl with plastic wrap and let the dough rise until doubled in size, about 2 hours. Coat two 9-inch pie pans with cooking spray. Divide the dough in half and form dough into a boule (Check out this video for direction, note - don't use so much flour as that guy!) Place boules in the pie pans, cover with plastic wrap. Let the boules rise until they fill the pie pans completely. Preheat oven to 350 ºC. Beat egg with 1 tablespoon water until frothy. Brush boules with egg wash, gently, they will easily fall. 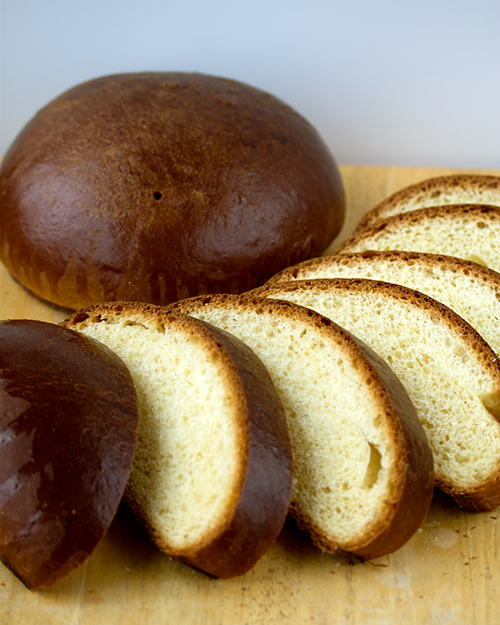 Bake loaves for 50-60 minutes, until internal temperature reaches 190 ºC. The outsides of the loaves will get really dark way before the inside is cooked. Resist the urge to take them out of the oven! At the halfway point, rotate the pans. 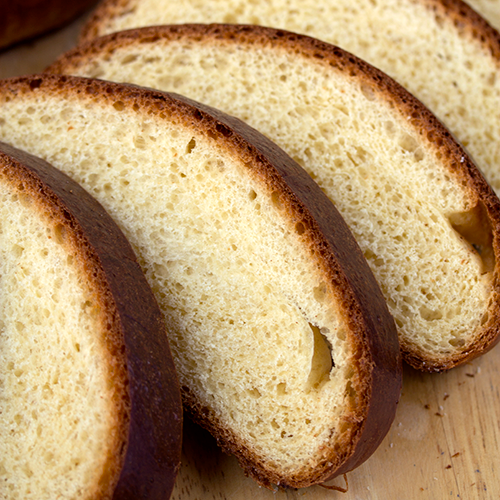 Once loaves are baked, remove them from the oven and from their pans. Let cool completely on a wire rack. Don't slice the bread until they have cooled for about 90 minutes.